A dump truck drops off a load of snow Monday morning in the parking lot at Jennings Beach. Trucks were arriving every few minutes to unload snow gathered from Fairfield streets. First Selectman Michael Tetreau was impressed -- not just with the 35 inches of snowfall that might be a record a single storm record in town -- but the with determination and willingness of Department of Public Works crews to fight back in the face of the blizzard. "We're kind of in `grind it out' mode," Tetreau said Monday, as rain and sleet fell, compounding the challenges of clearing all the snow that was dumped on town over the weekend. 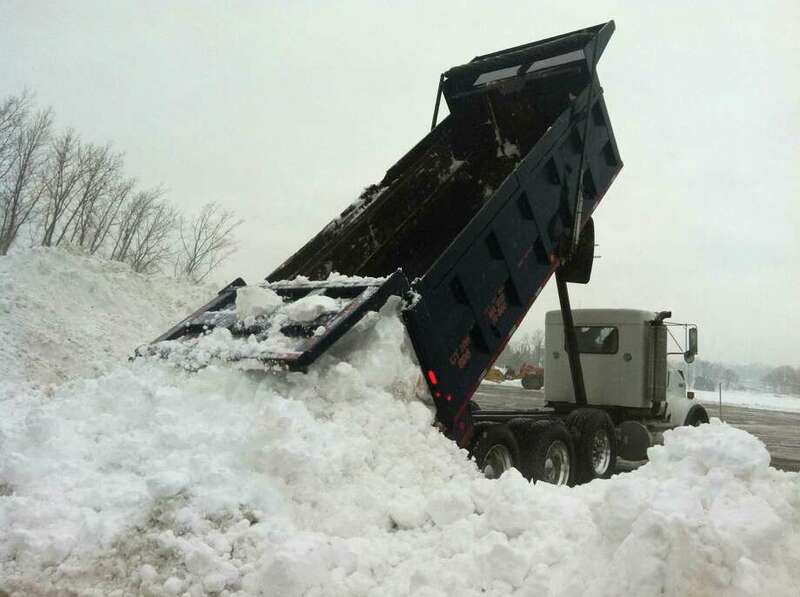 "I'm very impressed with our DPW, with the crews and their stamina and their determination to fight through a blizzard ... They took it as a personal challenge," he said." He said the first public works crews were deployed at 7 a.m. Friday and worked through Saturday night before getting a respite. "And then they were back bright and early Sunday." By Monday afternoon, Tetreau said close to 100 percent of the town's 270 miles of roads had at least one lane open. "The goal today is to have two lanes, and get the payloaders out to cul-de-sacs to get the snow out of the turnarounds." This evening, trucks will look to get school parking lots cleared in anticipation of classes re-convening after a three-day "blizzard break" on Wednesday. "We still have some concerns over whether we can get all the roads `bus ready,' " the first selectman said. "We're also very concerned about sidewalks not being cleared for those who walk to school, and kids waiting in the street for buses." The huge amount of snow is making this storm cleanup so different than others in recent memory, Tetreau said. "The reason places like Rochester, and Buffalo and Syracuse are ready all the time is because it happens all the time there," he said. For Fairfield to quickly handle so much snow, Tetreau said, would mean having 30 or 40 payloaders, not 10 or 15. "It's a question of what amount of readiness do you want to have," he said of storm preparedness -- and the costs. Tetreau said the state receive approval from the federal government that will allow local officials to apply for Federal Emergency Management Agency reimbursement of 48 hours of snow removal, and the governor has submitted a request to extend that. Meanwhile, police Sgt. Suzanne Lussier said officers are continuing to respond only to emergency calls. "We've had a very low call volume," she said. While the town's main roads are getting more and more passable, Lussier said people should not venture out unless absolutely necessary. Even downtown, she said, many businesses remained closed Monday. At one point, Lussier said, the Post Road traffic circle had just one lane open. "People didn't know what to do," she said. "Obviously, people should still limit their travel," Lussier said. "Some roads are only one-car-width wide. Stay home and allow the DPW to clear the roads." As many people used social media to stay connected, and updated, during the storm and its aftermath, it also was a place for many to vent their frustrations with the town's response. Tetreau said anyone with concerns or questions should contact the town's call center at 203-254-4899.